Normal black asphalt absorbs around 80 to 90 percent of sunlight. 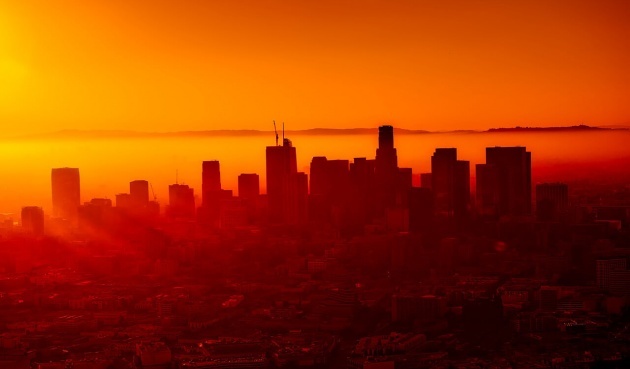 This is a big concern in areas like Los Angeles that receive a lot of sunlight. The asphalt absorbs the heat and reflects it back, leading to urban temperature increases. The high temperatures, in turn, lead to more need for energy-sucking air conditioning. Demonstrations have shown that painting city streets with a hard-wearing grey asphalt paint can reduce temperatures at street level by as much as 10 degrees Fahrenheit. The grey CoolSeal paint, produced by California-based GuardTop, works by reflecting the sunlight, lowering ground temperatures. Los Angeles is the first city to test the treatment on sections of public road, after initial trials on parking lots proved successful. The test will also measure how quickly the grey coating turns black from traffic, and how Angelenos react to the new street color. Residents living in the neighborhood being used for the tests reported that they could feel a difference in temperatures after just a few weeks.